Blood: 0.5 - 1 ml whole blood in EDTA blood tube. blood must be collected by a veterinary surgeon who will also sign the form to confirm animal identity. Vets usually have EDTA blood tubes, if not, your can request the tubes free of charge using the order material form (click here) , or email us (info@laboklin.co.uk ) and we will send you the EDTA blood tubes, please provide your address, the number of animals to be tested and the tests required. Buccal Swabs: buccal swabs can be used by owners to obtain DNA sample from the mouth, buccal swabs are available from us free of charge and can be requested on the order material form (click here), or email (info@laboklin.co.uk) and provide your address, the number of animals to be tested and the tests required. We will then send you a testing kit with instructions on how to obtain DNA sample from the mouth. Instructions can also be downloaded from this page. When you receive the buccal swab testing kit, the kit will contain buccal swabs, instructions, order forms, labels and a return envelope. When you return the samples, please make sure that you weight the envelope and put the correct postage, otherwise there will be delay. for genetic tests in horses, DNA sample can be either Hair or blood : Hair, this is the easiest method to obtain DNA sample, hair samples have always been reliable source of DNA. 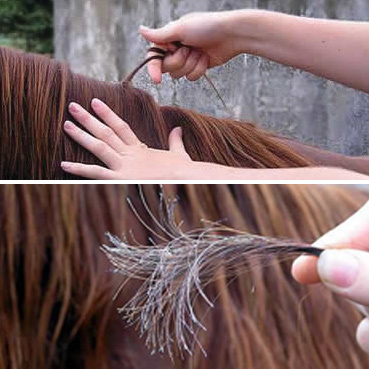 Pull around 30 hairs from the mane of the horse with the roots (in foals hair from the tail maybe taken). Wrap the hairs around your finger or a comb, as close as possible to the skin to ensure you obtain the hair roots. Keep dry, put in a bag, label the bag with the horse name, test (s) required. Place in an envelope and send back to us together with the order form. Broken or cut off hair will not be accepted. Blood: 0.5 - 1 ml whole blood in EDTA blood tube. blood must be collected by a veterinary surgeon who will also sign the form to confirm animal identity. Cattle and Pig : 0.5 - 1 ml whole blood in EDTA blood tube.